This 2 to 3 day stretch of the Dolores is a nice family scenic float (when the water is running). Paradox and Mesa canyons offer a nice wilderness experience and several camps. From Bedrock until you reach Paradox Canyon there is mostly flatwater. Where the San Miguel river joins the Dolores in between Paradox and Mesa canyons you can expect more water below there. 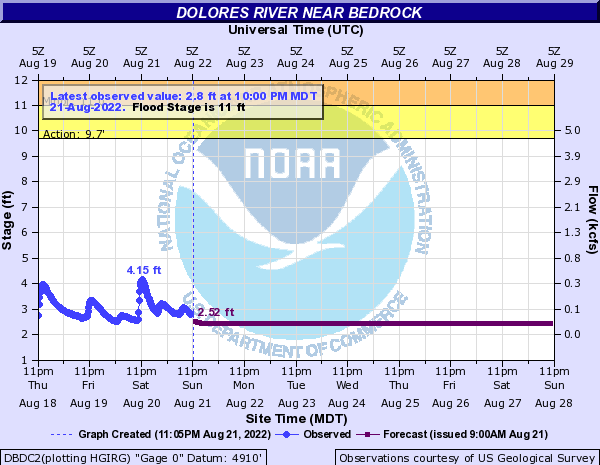 Primary Gauge DOLORES RIVER NEAR BEDROCK, CO.
Highway 141 follows the Dolores from the south for quite a while. When you get to the Gateway Resort and the road crosses the bridge, look for the ramp on the southeast side of the bridge.